This post was written in response to recent postings on social media — see the posting below. It addresses fears that there has been an “escalation of aggressive or dangerous coyote behavior” if a coyote approaches a leashed or larger dog, hisses, uses frequently-used paths, or nips a dog in the haunches during pupping season. This is not so — these are not indications of progressively dangerous coyote behavior. They are normal coyote behaviors during pupping season which have to do with parental protectiveness, not with coyotes “becoming more aggressive”. A friendly reminder . . . Leashes in-and-of-themselves do not keep coyotes away from dogs. Coyotes do not know what leashes are and probably are unaware of them. No one ever said leashes would keep coyotes away. What leashing does is to keep the dog close to you and under your control. A leashed dog is also a calmer dog. You can control a dog which is leashed; you cannot control an unleashed dog. Most effective is a short leash, not a long retracting leash which allows your pet to wander 20 feet away from you: 20 feet away is not very close. Keeping your dog close to you, leashed and under control, discourages but does not prevent coyotes from approaching. However, your goal is to totally avoid an encounter, and for that leashing also MUST be paired with walking the other way. Walking the other way is the key. In the unlikely event that a coyote does approach a dog, he’ll usually do so from behind if possible. They are smart and want to avoid the dog’s teeth. They also want to remain undetected as long as possible — coming up from behind accomplishes this. This is why it is important for a dog walker to always remain vigilant — keep an eye open in all directions around you, and when you see a coyote, no matter how close, walk away from it, dragging your dog if you have to. Sometimes you can stop a coyote who is approaching your dog from approaching further by facing the coyote, or leaning down to pick up a small stone and tossing it in the coyote’s direction. Then walk slowly away from the coyote. If the coyote has already come next to your dog, you’ll need to quickly pull your dog firmly away from the coyote, dragging while you distance yourself and leave without running. It’s important to prevent further engagement by leaving — leaving is the important point. So, please don’t let the coyote get close to your dog in the first place: an ounce of prevention is worth a pound of cure. Coyotes have nipped the rump or tail of dogs to message them if they feel their areas are threatened, usually when the dog has come into a sensitive area. This is normal, standard coyote behavior, especially during pupping season — it is how a coyote would communicate to another coyote. 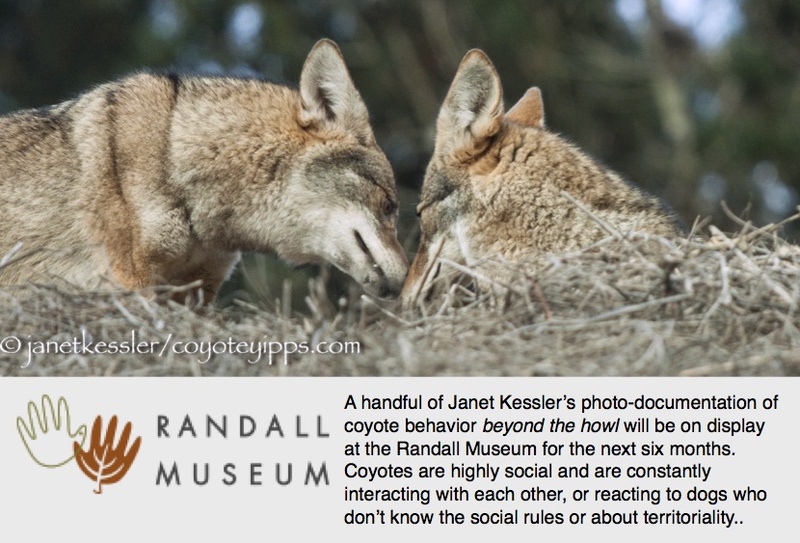 It has nothing to do with “escalating or progressive aggression” of a coyote. It doesn’t matter if your dog is docile or more assertive — the coyote will want to message any dog he considers a threat — it has less to do with the dog than with the space and the season. Please pay attention to your surroundings — being zeroed in on an iPhone precludes vigilance. Always, always, keep looking around. The better we understand coyote behavior, the less likely we will be surprised by an unexpected behavior, and the better we will be able to deal with such contingencies. To put this in perspective, coyote nipping behavior is not something which occurs at all frequently, but it has occurred, which is why I’m trying to make everyone aware of it. It is exceptional coyote behavior which all dog owners should be aware of, and, just in case, be prepared for, during pupping season. Your dog is much more likely to be bitten badly by another dog than a coyote. Also, I want to point out the incident I saw today, and which I see all too frequently: a dog ferociously pursuing a coyote. It’s fun for the dog — it’s terrifying for the coyote. The coyote ran for his life and remained as hidden as he could under a bush from the harassing dog. The owner was not even aware of what was going on until she was yelled at to leash her dog. Whereas a coyote will normally nip a dog’s rump as a message, dogs can actually maul coyotes, compromising their ability to survive: no one will help them with their wounds. Please keep your dog away from coyotes — it’s best for both dogs and coyotes. Please note that “hissing” is not hunting behavior. It is “warning” behavior: a “message”. Move away from the coyote as you would from a skunk with its tail up. This, below, was posted on various neighborhood internet groups under the title: “Aggressive coyote incident on 65 lb. ON LEASH dog” . It shows lots of concern and fear for what the author thinks might be “escalating dangerous coyote activity” — this is not what is going on. I hope I’ve helped explain the activity as normal coyote behavior above.